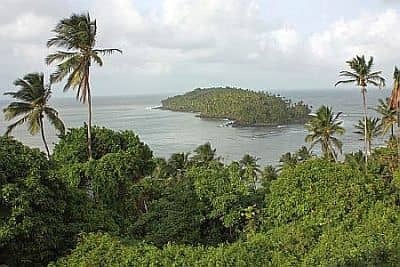 In French Guiana, a country located just north of the Equator, the climate is tropical, hot and humid throughout the year, with a relatively dry, slightly warmer season from July to November and a rainy season from December to June. Temperatures are high all year round: lows are always above 20 °C (68 °F), while highs in Cayenne range from 29 °C (84 °F) between January and May to 32 °C (90 °F) in September and October, which are the hottest months because they are the driest and sunniest. However, at this time, the humidity is a bit lower, around 65% during the warmest hours, while in the rest of the year, it exceeds 70%. In the hottest days, however, the temperature can reach 37/40 °C (99/104 °F) from May to November. - the short rains period, in December and January. This is due to the fact that the intertropical convergence zone (ITCZ) passes over the country from north to south. On the coast, the rains, sometimes intense but generally short-lived, occur mainly at night and in the morning. The northeast trade winds blow with moderate intensity on the coast, and the sea can be rough. - the short dry season, called the short summer of March, which may also occur in February. This happens because the ITCZ is by now to the south of the country, so the weather tends to be sunny, but owing to its brevity (one or two weeks), it is not reliable, in any case, it's more evident in the northwest (see St. Laurent du Maroni) than in the south. In this period, the wind can even bring dust from the Sahara desert. - the heavy rains period, from April to June, with the peak in May, when the ITCZ arrives again, this time from the south, bringing a lot of heat and humidity from the Amazon rainforest. The wind is weaker, and the humidity makes the heat stifling. On the coast, the rains mainly occur at night and in the morning. The rains are more abundant, and they are often torrential, along the central and eastern part of the coast (see Cayenne, Saint-Georges-de-l'Oyapock), where they can easily create flooding. In May and June, more than 300 mm (12 in) of rain fall per month in St. Laurent du Maroni, and even more than 500 mm (20 in) in a single month (May) in Cayenne and in Saint-Georges-de-l'Oyapock, in the east. In this period, it rains almost every day. During the dry season, from July to November, the ITCZ is located to the north, but not by much, and in any case, thunderstorms can form in inland areas and the move towards the coast. In September and October, the least rainy months, rainfall amounts to around 40/50 millimeters (1.6/2 inches) per month in Cayenne, a little more in Maripasoula, in the west, where it's around 70/80 mm (2.7/3.1 in) per month, and even more in St. Laurent du Maroni, in the far north-west, where it's around 100 mm (4 in) per month, but it is still lower than in the rest of the year. French Guyana is outside of the path of hurricanes, which pass more to the north, over the Caribbean Sea. Here are the average temperatures of Cayenne, the capital, located in the central part of the coast. In Cayenne, total annual rainfall is up to 3,200 mm (124 in). Here is the average precipitation. The humidity is high throughout the year, making the heat sweltering, especially in the interior, while on the coast, at least the breeze blows. The most humid period is that of the heavy rains, from April to June, while the humidity is lower in the least rainy and warmest period, from August to October. There is not much sun in the wet season, from December to June, when there are about 4/5 hours of sunshine per day, while the sun shines quite frequently from July to November, when the average rises to 7/8 hours per day. Here are the average sunshine hours per day in Cayenne. Off the coast, there are some small islands, such as the famous Devil's Island, with a climate similar to that of the coast. The sea is warm enough for swimming all year round, since the water temperature is around 27/28 °C (81/82 °F). The sea is not particularly clear and has often a brown color (except in the islets that are located offshore) because of the large quantity of water coming from rivers, although it is generally clean (except in the vicinity of the cities). It's better to swim at high tide, since during low tide, the uncovered part of the beach can remain muddy. From December to April, the coast can sometimes be reached by abnormal waves, generated by Atlantic depressions that pass far to the north. The best time to visit French Guyana is from mid-August to mid-November, and in particular, the months of September and October, which are the least rainy and the sunniest, especially on the eastern part of the country. As mentioned, this is also the hottest period, but it is not as humid as the rest of the year, and in any case, what matters most is to avoid the heavy rains. Throughout the year: bring lightweight clothing of natural fibers, possibly with long sleeves for mosquitoes, a light sweatshirt for the rain showers or the sea breeze, a sun hat, and an umbrella (though it can be useless for heavy showers) or a lightweight and breathable raincoat. From December to March, you can add a sweatshirt for the evening.